The Virgin label had a somewhat brief flirtation with “roots” reggae in the mid-late 1970s. 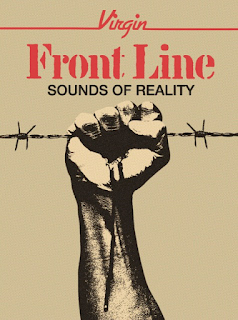 The “frontline” arm of the label put out some very credible roots reggae recordings in that period. 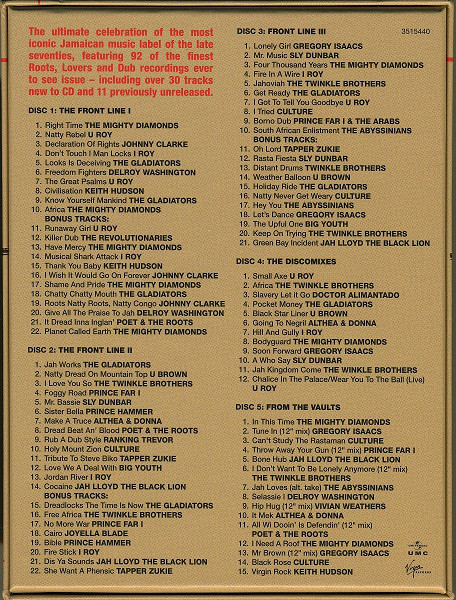 This excellent box set collects together the best part of one hundred tracks and the sound quality, is, on the whole, excellent, which is not always the case with seventies reggae. The reggae included on here is very much part of the “punk meets dread” fusion between punk rock and roots reggae that was very much the thing in the 1977-1979 years. Anyone who was into that whole scene back then, as I was, will love this cornucopia of crucial cuts. CD 1 features several of the early “toasters” (DJs who spoke/growled/croaked often incomprehensible Jamaican patois lyrics over existing backing tracks, often stripped down to a huge, booming bass and drum “dub” sound. Artists such as U-Roy and I-Roy are fine examples. 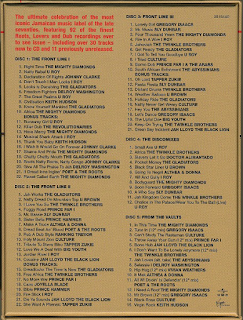 There are also the early rootsy vocal groups represented here such as The Gladiators and The Mighty Diamonds, along with solo roots singers like Johnny Clarke and Keith Hudson. CD2 moves very much into the “rocker and the ras” punky reggae party time, with cuts from the growling Prince Far I, Althea & Donna (no, not “Uptown Top Ranking”, either), Big Youth, Culture and Tappa Zukie. CD3 sees the arrival of melodious artists like Gregory Isaacs and The Abyssinians, who added an almost proto-lovers’ rock sweetness of delivery to their still rasta-conscious devotional music. CD4 sees reggae getting into dancefloor grooves with several extended 12” mixes that were starting to crossover onto more regular “disco” playlists. CD5 has dub rhythms (“riddims”) rear their bass-heavy, thumping head with some cuts typical of the sounds that would shake the speakers once darkness fell at Notting Carnival. There are far too many tracks to analyse and describe, needless to say that if you are a fan of mid-late seventies roots reggae of the sort that was so beloved of Don Letts, Mick Jones, Joe Strummer, Johnny Rotten, Jah Wobble and the like, then you will love putting this on and letting your sound system shake. Playing it digitally on “random” is a great experience too.